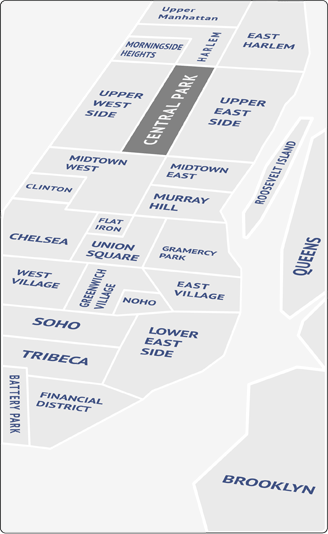 Clinton, which stretches from about 30th Street to about 42nd Street (some might say that extends all the way to 59th Street) between Eighth Avenue and the Hudson River, has come a long way since it was known as Hell’s Kitchen. Once known for seediness and gang violence (as depicted in West Side Story), the neighborhood began gentrifying in the 80s, and now is home to a lively mix of actors, young professionals and families. Despite its newfound gentility, though, Clinton still retains a lot of its old school charm; in other words, if you’re looking for Pottery Barns and Starbucks stores, you may want to move elsewhere. With lots of 4-6 story walk-ups, as well as some luxury doormen buildings and brownstones, Clinton has a diverse mix of housing. The walk-ups are small and cheap, still one of the best bargains for those on a budget. Ninth Avenue is lined with restaurants, and not just the kind whose steaming, stinking entrances earned this area its former moniker. Once Hell’s Kitchen became Clinton, chic places like Mario Batali’s Esca and Daniel Boulud’s DB Bistro Moderne came flocking. Nestled between the theaters of Broadway to the east and Lincoln Center to the north, you’re never more than a few minutes away from plays, symphonies and Andrew Lloyd Webber extravaganzas. For nightlife, the bars of Clinton are a dive connoisseur’s dream. But those who prefer sleek dance clubs with long lines and $12 drinks won’t be disappointed here, either. Aside from being a cool place just to walk around in, Clinton is bordered on its western edge by Hudson River Park, a narrow greenway that attracts joggers, walkers and work-dodgers year-round. And if you live in the northern reaches of Clinton, you’re steps from Central Park. Increased commercial activity (including a proposed sports stadium on the west side) should increase property values and further gentrify the character of the neighborhood.